The traditional song that is played by the Gopher band after a home sweep, the Battle Hymn of the Republic, was not on play list this weekend. In fact, it was put on the back burner after the gutsy overtime win Friday by the never-say-die Bulldogs. UMD backed Friday’s win with their second win in that many nights after trailing 2-0 in both games. The Bulldog sweep was the first since 2003 and the second since 1993. It does back a trip north on I-35 go smoother. In this battle of intra-state rivals, it was clear that the Bulldogs were going to do anything and everything to keep their good start to the season rolling. Pucks at the net is how teams win games. That philosophy resulted in a UMD goal off a Gopher defenseman’s skate in both games of the season. I read that luck is the residue of design; that design must be to pepper the net from all angles whenever the opportunity presents itself. The Bulldogs (9-4-1, 6-3-1) are now tied for first in the WCHA. Starting in Net. In what may be looked at as a shaky start, Brady Hjelle buckled down after 2 first period Gopher goals Saturday night to blank UMTC for the remaining two periods. Coupled with the strong performance Friday night by Kenny Reiter, the goaltender rotation should still be in effect when play resumes for the Bulldogs. Players Elevate. Jack Connolly has taken over the scoring lead in the nation passing teammate Justin Fontaine who is now number two. Jack had a great weekend picking up three games in the series. He should be a strong candidate for WCHA Red Baron Offensive Player of the Week. Giving Thanks. After a very entertaining and productive weekend of hockey, the UMD Bulldogs get a week off before entertaining WCHA powerhouses North Dakota and Denver at the DECC. A measure of a good team is how they respond to adversity. The University of Minnesota – Duluth Bulldogs took that step to being a top tier team in the WCHA. Friday’s game was a demoralizing defeat by MTU where the Bulldogs greatly outshot the patient and plodding Michigan Tech Huskies and received defeat from a couple of breakdowns and unfortunate plays. But that is the way Tech works and its UMD’s job to put it out of reach using their offensive prowess. The offense did show up Saturday and used all facets to score 8 goals led by Justin Fontaine’s 4 goals and 1 assist. Now to take the next step for UMD to become an experienced team that is also a contender, they must become consistent so games like Friday don’t happen. So teams that are at the bottom of the league are not stealing points, especially at the DECC, from the Bulldogs. Lesson learned? We’ll see in Minneapolis next weekend. Beavers and Gophers. A night after Minnesota handed BSU their first loss, Bemidji returned the favor stinging the Gophers 6-2 Sunday. The integration of BSU in to the WCHA maybe a smooth one the way they are playing this season. Rankings. As of this column, the Bulldogs fell two spots in the Inside College Hockey Power Rankings to #16. Undoubtedly that is a result of the loss to Tech on Friday night. 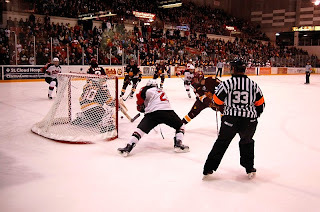 University of Minnesota – Duluth men’s hockey team returns to the site of their first round WCHA playoff sweep at the World Arena in Colorado Springs, CO. Colorado College is atop the WCHA just two points ahead of UMD. Return to Me. UMD was short handed even before all the penalties were called. Out from last Saturday’s game were defenseman Scott Kishel, Dylan Olsen and Trent Palm; right winger Justin Fontaine; and center Travis Oleksuk who has been sidelined since the second game of the season. Returning regular players to the lineup will help, especially on the road in the WCHA. Time Keeps On Ticking. The article on penalties maybe for naught. It is now official that UMD is the second most penalized team in NCAA Div. I hockey. Their 22.9 PIM/game is only eclipsed by Ferris State’s 24.6 PIM/game. To put it perspective, Wisconsin is second in the WCHA with 21.2 PIM/game. Keep on Scoring. Rob Bordson continues his tear with 1 goal and 4 assists this past weekend. His efforts and achievements are not being overlooked either. Bordson received nomination for Red Baron WCHA Offensive Player of the Week. Players who step up to become integral is what makes average teams better by creating more balanced scoring. Denver at Alaska – Anchorage: Denver will have to cope without Cheverie. What better team to get WCHA time for a freshman goalie than against Anchorage? The underlying interest here is the expected goalie for DU, Adam Murray, is from Anchorage, so this may not be the easiest place for Murray to concentrate. Denver will not have a problem scoring, but a tie here is definitely likely coupled with a DU win. North Dakota at Michigan Tech: North Dakota has shown some struggles on the road and Tech has shown flashes at home. It does certainly appear that this will be a Siouz sweep. Minnesota at Wisconsin: Border Battle continued after the Packer-Vikings game of last Sunday. The true test for Wisconsin is if they can complete a full weekend of games in the WCHA. The true test for Minnesota is to prove that they can compete with more than the bottom half of the WCHA. Both teams have something to prove, so why not say that you can throw the record books out and expect 110% from both teams while their backs are against the wall. That being said, I see Bucky coming out with a series win, 3 or 4 points. As the season continues, more trends come to the forefront. After this weekend, the standings should reflect those trends setting up. It will be a good weekend of hockey. Home cooking is what the Bulldogs need after the trip to Saint Cloud. Going 3-1 at home and 0-1-1 on the road, the team needs more game time under their belt and the best place to do that is at home. This weekend they renew competition against Clarkson of the ECAC. Lifetime series, UMD is tied 2-2 against the Golden Knights. The last meeting between the squads was in 1997, a UMD win in the Syracuse Invitational Tournament. Keep Out! The Bulldogs are averaging 22.7 PIM/game, second to Wisconsin in the WCHA. The penalty kill for UMD has been good with all the work they have had posting a 81.1% efficiency. As they stack up against Clarkson, the Golden Knights power play is currently at a 19.4% efficiency. You Take the Fall. Coupled with UMD’s problem with penalties is the positive that they have the ninth best power play in the nation at 25.6%. That mark still puts them at second in the WCHA behind Colorado College’s 32.4%. More Scoring to Come. Rob Bordson has 2 goals and 3 assists this year. His five point total this year is two shy of his previous two years at UMD numbers of 1 goal and 6 assists. Travis Oleksuk is still out with an ankle/leg injury. His promising offensive skills are being missed by the Bulldogs. UMD needs more players to get into the scoring column. As witnessed last weekend, the players who are doing the majority of the scoring may be held off by a good defensive plan or they may just have off nights. Whatever the reason, if you don’t score you don’t win. Rob Bordson, as mentioned above, and Kyle Schmidt showed great signs of improvement in this area last weekend. Defense will need to be more, well, defensive. Many times against SCSU last weekend a defenseman carried the puck into the offensive zone only to have it stripped and taken the other way. The most alarming time this happened was during UMD’s power play chance in overtime on Friday. Defense needs to take care of business in their own end first, then get involved on the other end. Who will be the starting goalie tonight and Saturday? Is a splitting of nights going to occur? We will have to wait to find out. Alaska – Anchorage at Minnesota: All college hockey fans will keep at least one eye on Minneapolis this weekend to see if this Gopher team can pull out of their dive. It may be the right weekend to do that seeing that the Seawolves are in town. But it could also backfire if the trend isn’t because they were playing the “elite” teams. Saint Cloud State at Michigan Tech: Battle of the Huskies will see if a mediocre SCSU team can get things done on the road. Likewise, the Tech offense is going, now they just need a backstop to keep the puck out of the net and they may roll. Minnesota State Mankato at Denver: This series should be two more chances for Cheverie to add shutouts to his stats. New Hampshire at Wisconsin: This will be a good non-conference match up to see if the Badgers are the team that played last Friday night (6-0 win) or Saturday night (3-2 loss) at Mankato. That is the way you do it! It may not have been really pretty Saturday night, but the good teams get the job done against the lower half teams. That is exactly what happened in Duluth again the MSU Mavericks. Good play all around, but the goals not going all around. If your last name is not Connolly or Fontaine for UMD, then you did not score one of the eight goals this past weekend. To compliment the good goalie play by Hjelle, the offense needs to start spreading it around before the Bulldogs meet a team that can shut down those names. As mentioned, Hjelle had a good weekend as well as most of the UMD defensive corps. Let that be a trend that continues! A 5-11, 175-pound junior from Bonnyville, Alberta, Fontaine scored twice - including the game-winning goal - and assisted on another goal in leading UMD to a 5-2 win over Minnesota State last Friday (Oct. 16) at the DECC in Duluth. He then had a pair of tallies the following evening (Saturday, Oct. 17) as Minnesota Duluth rallied past the Mavericks 3-2 to complete the series sweep. In addition to his five scoring points in the series, Fontaine put a team-high seven shots on net Friday and scored with 7:37 to play in the third period Saturday to break at 2-2 tie and seal the UMD victory. Three of his four goals in the series came on the power-play. Wrong Call on CC. Maybe they do have life after Bachmann, as noted by the three point weekend in Madison. Joe Howe, the freshman net minder, stopped 65 of 68 Badger shots on his way to being named Red Baron WCHA Rookie of the Week. Special Teams on Tap. This next weekend at Saint Cloud State, UMD will pit its power play against the Huskie’s. Both teams posted all three of their team’s goals on the power play in their respective Saturday wins. Might be a shootout, or an even strength grind it out kind of games. More to come Friday. Tonight marks the new year in the WCHA, and the conference season starts with a bang when the University of Minnesota Gophers make the trip to Grand Forks to play the-team-to-be-named-later. It should be interesting to see if the UND squad has yet another slow start to the season or if they still have mastery of the Gophers in the Ralph. This is also the night that the University of Minnesota – Duluth Bulldogs host the Mavericks of Minnesota State University Mankato. I hope we got the name correctly to not offend (see media guide from MSU). MSU is coming off a sweep of a program that is on life support, Bowling Green. This will be the first games that should or could challenge the Mavs. On the flip, UMD needs to come out to play TWO nights this weekend. Not just one as Coach Sandy stated last Sunday night after a disappointing 3-1 loss to Northern Michigan. Look for scoring from UMD and a sweep in the DECC. The other conference match is CC at Wisconsin. It will be interesting to see how good, or bad really, CC will be this year after the loss of so many key players. Just one point for CC this weekend would be surprising and a good start for them. It is the start, but not time to start slow. All games have meaning for UMD as Coach Sandy is looking to go over .500 in WCHA play for the third time in his 10 year tenure. We will watch, wait, and, “enjoy the season” (Mike Tice). Sept. 29 — Denver is the runaway favorite to win the WCHA this season according to both the league’s coaches and media. The Pioneers took eight of the 10 first-place votes in the Grand Forks Herald coaches poll, while 23 of the 25 voters in the madison.com media poll put Denver first. North Dakota, Wisconsin, Minnesota and St. Cloud State rounded out the projected top half of the standings in both polls. Minnesota forward Jordan Schroeder was the choice for player of the year by the media, and he shared that honor with St. Cloud State forward Ryan Lasch in the coaches’ voting. St. Cloud State goaltender Mike Lee was the consensus pick for rookie of the year. The all-league first team, picked by the media, included Schroeder, Lasch and a tie between Minnesota-Duluth’s Justin Fontaine and Denver’s Rhett Rakhshani at forward; Denver’s Patrick Wiercioch and North Dakota’s Chay Genoway on defense; and Denver goaltender Marc Cheverie. What is very interesting is the polls are the formats and the number of voters are different, but the results are the same. Coaches vote, obviously, in the coachs' poll and cannot vote their team as #1. The media poll does not have rules like the coaches. The media panel is made up of: Kevin Allenspach, St. Cloud Times; Roman Augustoviz, Star Tribune; Andy Baggot, Wisconsin State Journal; Mike Chambers, Denver Post; Bruce Ciskie, UMD radio/Fanhouse.com; Chris Dilks, Western College Hockey Blog; Shane Frederick, Mankato Free Press; John Gilbert, WCHA.com; Kurt Haider, UAA radio; Dirk Hembroff, MTU radio; Tim Hennessey, UND radio; Ken Landau, CC radio; Don Lyons, SCSU radio; Todd D. Milewski, USCHO.com; Dan Myers, collegehockeynews.com ; Jess Myers, insidecollegehockey.com/USA Hockey Magazine; Joe Paisley, Colorado Springs Gazette; Kevin Pates, Duluth News Tribune; Brian Posick, UW radio; Brad Elliott Schlossman, Grand Forks Herald; Wally Shaver, Minnesota radio; Theresa Spisak, USCHO.com; Jay Stickney, Denver radio; Mike Sullivan, MSU radio; Doyle Woody, Anchorage Daily News. The UMTC Gophers have their Fox Sports North TV network on their side and now the Bulldogs have their network in place. Well, network-light and in a different form of media, but a network nonetheless. And it is great news! With success comes the opportunity to branch out to fans and possible recruits to UMD. More coverage is always good. The announcement of a Northern Minnesota radio network carrying UMD hockey games this season provides the ground work for expanded interest. The televised games are already broadcast on regional (statewide) Charter cable, but it leaves many games out. The new radio home will provide all games to the expanded audience. So now if you are on the move and want your Bulldog coverage, you have a much better chance to get your fix! The Bulldogs will be broadcast on the Fan 1490 in Duluth/Superior; KQ 105.5 in Grand Rapids/Hibbing; and KQ 106.7 in Ely/Virginia. It is unknown at this point if streaming will be available as hockey information is not currently on the “Bulldogs on the Air” section of their webpage. Scott Sandalin’s contract extension the University gave him this summer was a good move. Sandy, as evidenced by this last season, can do a competent job at taking the players his program recruited and get them to play their best…..at least when it counts the most. As evidence, UMD became the only Final Five Play-in team to win the tournament. That run at the end ensured an NCAA berth and gave us the “Miracle at Mariucci” as some have dubbed it. Timing is great, consistency is better, and winning consistently is best. The extension is for two years past this next season, the last on the current contract. Two years doesn’t seem like a very long term commitment from the University. Maybe the consistency piece is still up in the air and needs to be settled and they have given two years to see what happens. Sandy has coached two teams to the NCAA tournament in nine years and one to the Frozen Four. He has also led teams to finish in the bottom half of the league seven of those nine years and 8th or worse four times . Was extension in the works all along, or did last season’s run at the end buy some more time? My perspective and hope is that Sandy has it going now and that every season UMD will be a contender in at least the WCHA. 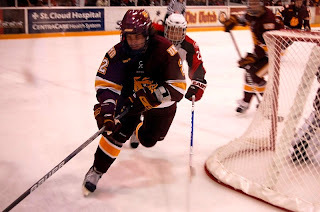 In a press release late Friday afternoon, the University of Minnesota – Duluth announced their 09-10 hockey schedule. The squad starts with an exhibition game on October 3 followed by the start of season hosting home games in the third year of the Superior Cup. UMD starts their WCHA portion of the schedule the next weekend, October 16-17, hosting Mankato State. The Bulldogs start with six of eight games at home and extend that to the winter holiday break with a streak of 12 of 18 games at the DECC. Coach Sandelin has already stated that the team must come out strong and take advantage of the home games in the first half of the season because the road games will be plentiful after the new year. Some highlights of the schedule are: at Michigan Tech for Winter Carnival, both home and away series with UMTC, a home and home series with Frozen Four participant Bemidji State, and non-conference home games against Clarkson. I have heard from a very reliable source that Steve Rohlik, the current UMD assistant coach and former UNO assistant coach, is in the running for the head coaching job for the Mavericks. Rohlik was an assist at Omaha for 3 years starting in 1997. Steve has been an assistant as UMD since Sandelin became the head coach. If Rohlik does leave he will certainly be missed at UMD.